This week is National Public Health Week (NPHW). The annual observance brings U.S. communities together to recognize the contributions of public health and highlight issues that are important to improving the public’s health. The theme for National Public Health Week (NPHW) 2012 — A Healthier America Begins Today: Join the Movement — addresses the issue of prevention and wellness. 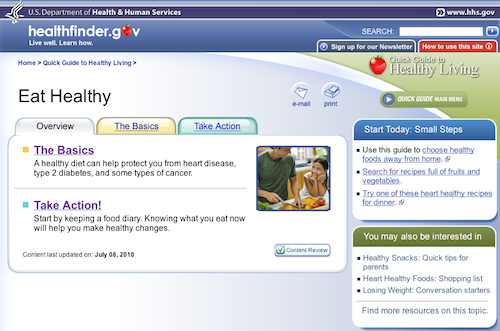 Earlier this year, we reported on the National Health Observances Toolkit, a resource at healthfinder.gov to help promote certain health observances. Late last month, they released another really useful tool: the Quick Guide to Healthy Living. Your job, friends, the kids — we’re all on tight schedules these days. You try to stay up-to-date with prevention and wellness tips, but often there isn’t time to search through all the complex health information on the Web. The Quick Guide to Healthy Living now makes it easier — and faster — to find actionable prevention and wellness tips. Most of the guides have three sections, displayed as tabs on the page: Overview, The Basics and Take Action. Each guide also provides suggestions — Start Today: Small Steps — to help you get started right away. With over 80 health and wellness tips, there’s something for everyone. 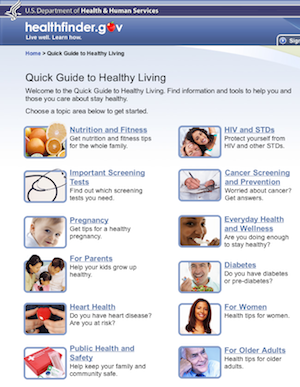 It’s easy, it’s fast and it’ll help you stay healthy: the Quick Guide to Healthy Living from healthfinder.gov.